Sandú Darié studied law in Paris (1926-1932), where he worked as a caricaturist for Romanian and French media and developed ties to Surrealist circles. Moving to Havana in 1941, he began to paint, and in 1945, he became a Cuban citizen. 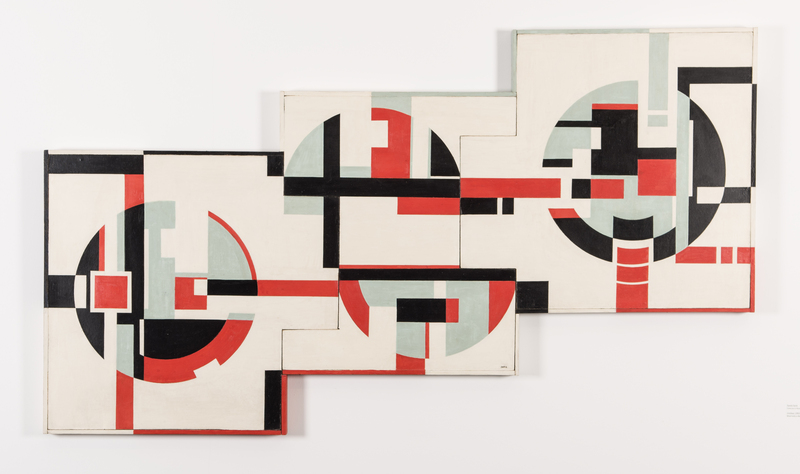 His first works, known by the generic title Composiciones, were exhibited in 1949 at the Lyceum Lawn Tennis Club (Havana) and the Carlebach Gallery (New York). They were characterized by lyrical abstraction. Free of all objective and anecdotal reference, they depicted great stains, vertiginous outlines, and brilliant colors and were influenced by the nature and light of the tropics. Shortly after, inspired by Neoplasticism and the discovery of the Madí movement, Darié moved towards Concrete Art. Invited by Gyula Kosice, with whom he maintained correspondence for nine years, he participated in exhibitions organized by the Madí and collaborated in the creation of the magazine Arte Madí. In 1950, Darié exhibited his Estructuras pictóricas at the Lyceum Lawn Tennis Club (Havana). They were assemblages in which he distanced himself from the confused forms of the lyric abstraction favoring greater formal rigor. In 1952, he founded, with Mario Carreño and Luis Martínez Pedro, the magazine Noticias de Arte, through which the current trends of abstract-geometric art were promoted. In the middle of the decade, he experimented with kinetics with his Estructuras transformables, presented at the collective exhibition Primera exposición concreta (Faculty of Architecture, University of Havana, 1955). In these works, the pictorial plane served as the base from which a series of movable colored helices could be activated to rise by the spectator. In this same exhibition, he presented Multivisión espacial, the first of a series of works in which the circular form, complete or fragmented, served to integrate the rest of the geometric forms. Between 1958 and 1961, Darié belonged to the group Diez Pintores Concretos, formed around the Galería de Arte Color-Luz (Havana), which was owned by Loló Soldevilla and Pedro de Oraá. He participated in creating the portfolios of serigraphs titled 7 pintores concretos (1960) and A (1961), and he was actively involved with the group that played a role in the diffusion in Cuba of abstract-geometric art. In the 1960s, Darié expanded his artistic experience into new territories with the experimental documentary Cosmorama. Poema espacial n° 1, made with film director Enrique Pineda Barnet (1964). In this pioneering Cuban experimental film, forms, lights and colors in movement give rise to a novel concept of audio-visual kinetic art. This documentary was presented at the exhibition Cosmorama Electropintura en movimiento (Museo Nacional de Bellas Artes, Havana, 1966). Darié continued working with this medium, producing El bosque bajo el puente (1965), Caminos del saber (1966), El gran viaje (1966), La cocotología (1967), El vuelo cósmico (1967) and Cuba frente al mar (1968), among others. Thereafter, Darié began to produce lumino-kinetic architectonic installations, a field in which he was prolific. Among his pieces were the luminic towers for the Anfiteatro Flotante (Parque Lenin, 1971), the sculptures Construcciones (Parque Cuatro Caminos, 1977), the environmental sculpture El árbol rojo (Palacio de Pioneros Ernesto Guevara, Parque Lenin, 1981), the murals El día and La noche (Hospital Hermanos Ameijeiras, 1982), the murals Colores Ondulantes en el espacio (Fábrica de Toallas del Wajay, 1983) and the sculpture La columna de la vida (Instituto de Genética y Biotecnología, 1986), all in Havana.